If you love to share inventive and creative ideas with the world on your blog, then I'm sure you're no stranger to Hammacher Schlemmer. For 170 years they have been known for being the “everything” store from their original store in New York, to their catalogs delivered to your doorstep, and now to their vast online store. When I realized that Hammacher Schlemmer had an affiliate program, I had to jump on board with it! It's a perfect pair for so many bloggers to utilize due to the huge variety of products they offer. If you're familiar with Hammacher Schlemmer, but not with affiliate marketing then I'll give you a quick overview. Affiliate programs are a way for companies to create partnerships with people who will help advertise their products and services. As a reward, that company provides them with a % of commission from any sales that happen from that advertisement. Everything is tracked online easily using your own unique customer ID so you get credit for the commission. With Hammacher Schlemmer, nothing is needed to qualify you just have to sign up first on the CJ Affiliate portal here: https://signup.cj.com. I'll review more below about how to use the program. It's quite hard to describe the products on Hammacher Schlemmer as they are so vast. The great thing about the company is that if you cant find it somewhere else, you'll probably find it here. They showcase many of the newest innovations from around the world including a hovercraft, life-size killer whale submarine, your own personal floating water park, and much more. Their products can be seen on on the “Gotta Have It” segment on Fox Business News where the CEO Rich Tinberg has a segment of the most unique one-of-a-kind gadgets and gifts. You can find their products many ways including visiting their landmark Manhattan store which offers some of the best and unexpected gifts in their showcase room. You can also still request to get that thick hundreds of pages catalog that we all used to page through as kids before Christmas time. And of course, everything is now online making it the easiest (and greenest) way to shop. Through Hammacher Schlemmer you get a flat 8% commission on all products that are sold via your affiliate links and banners. This excludes gift cards, but includes all other products. When a customer clicks any of your affiliate links, for the next 30 days if that customer purchases anything online on Hammacher Schlemmer's site, you'll get the commission from any sale. After 30 days, you no longer receive the commission from sales unless they click your link again. The commission from Hammacher Schlemmer is quite a bit higher than most companies at 8% as most online stores only provide between a 3-5% commission on products so as an affiliate they treat you well! While there are many companies similar to Hammacher Schlemmer, none can compare to the premium, high-quality products that they offer (most often sold at a premium price) with such excellent customer service. There are some that we can compare that have affiliate programs which include companies like Brookstone and Amazon. Brookstone does have some of good products but are more focused these days on bedding, massage, and female products. They do offer the same competitive commission at 8%. Amazon on the other hand does have a large variety of products similar in nature, but they do not have the unique high-end products that Hammacher Schlemmer offers. Amazon has a commission rate ranging between 4-8% depending on the product type. Holiday blogs, outdoor explorers, home and garden lovers – no matter what your niche is, Hammacher Schlemmer will be a perfect pair for you to write about. Let me give you a few examples of websites you can create which you can advertise Hammacher Schlemmer products on. Starting with Holiday Blogs, this is a pretty trendy thing to do now because there is always a holiday coming up and everyone loves finding new ideas. If you start a holiday blog, the month before that holiday is coming up, search on Hammacher Schlemmer for the most unique gift ideas that they have to offer. Spend some time researching them and post your top 10 best holiday gift ideas. You can do this for every holiday no matter how big or small. Outdoor explorer blogs are really fun to write about because you can venture into so many corners of the world and Hammacher Schlemmer has some really incredible ideas for items that will compliment your adventures. Whether this would be an inflatable water obstacle course, backyard dunk-tank, a flying hovercraft, and even personal submarines. They have some really insane items that make for some great trendy blog topics! 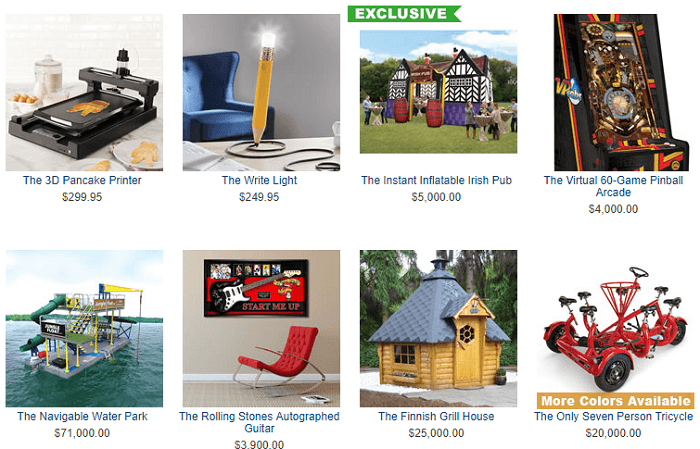 Can You Make Money With The Hammacher Schlemmer Affiliate Program? Making money with the Hammacher Schlemmer affiliate program is easy, but it does require a bit of setup prior to getting on it. To start, Hammacher Schlemmer has enlisted their affiliate program to a 3rd party company called CJ Affiliate which hosts their company's program and gives you the information and tools you need to start advertising. To get setup, first sign up here: https://signup.cj.com. 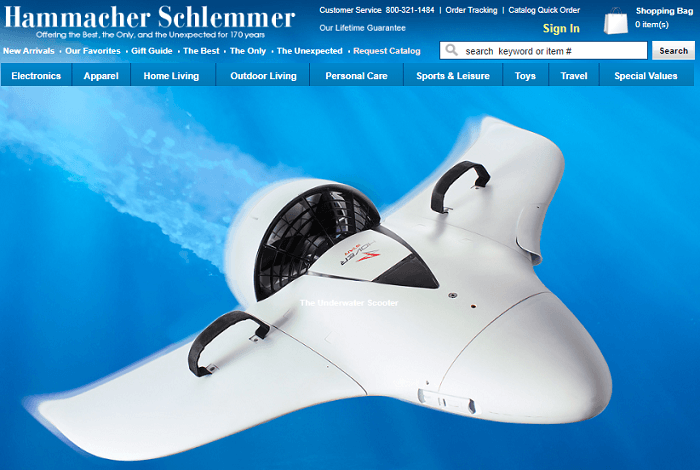 Once your profile is created, go under the Advertisers tab and search for Hammacher Schlemmer. While most programs under CJ Affiliate portal require you to be pre-approved, the Hammacher Schlemmer program requires no approvals prior to signing up, simply search for it and you're ready to go with advertising their products. If you want to see all of the program terms and information, click on the Program Terms tab. This will show you the commission and any of the restrictions and prohibited activities. How to utilize the Hammacher Schlemmer Links and Banners? Get Links: Under the Get Links section, this is where you can find both hyperlinks and banners for Hammacher Schlemmer sales items, promotions, and different advertisements. The banners are great for putting up on your sidebars, headers, and footers so you can show off the different great items that Hammacher Schlemmer has to offer. The text links are great to use when you are talking about specific topics and can then embed the hyperlink into text making it easy for customers to find and access. Get Products: This is for each of Hammacher Schlemmer's specific products. You will find almost every product from their website under this section and this is how you can then hyperlink the item in your blog or social media post when you talk about it. Using the Get Links and Get Products are both similar but used for different situations. Get Links is for more generic topics on Hammacher Schlemmer, and Get Products is when you want to advertise a specific item from the company. What is the key to making money? Know and love the products that you're talking about. If you simply post the items all over your social media page or blog site but dont give it a good review with talking points, nobody will find it interesting. If you take the time to research the product and give your reader some really catchy information on it they will be more inclined to look into it further. The key is to always have great content along with great products. With any affiliate program there will always be up sides and down sides, so lets talk about a few of them.